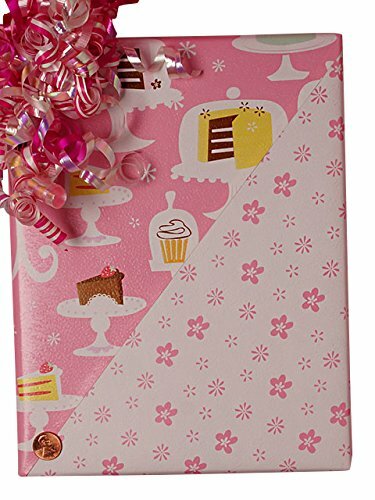 24" X 417' Cake And Flowers Gift Wrap - Floral Wrapping Paper is available in a variety of sizes and styles. Choose from 15 and 100 rolls to larger 417 and 833 counter rolls. We carry many styles including leaf patterns, real-looking flowers, and modern stylized patterns. Paper weight varies by the style of paper, the larger the number (i.e. 32#, 40#, 50#, etc. ), the thicker the paper will be.Click the magnifying glass to see full pattern of floral giftwrap.Some papers are stored in our warehouse and shipped to you from California. Other papers are shipped direct to you from factories in the North East. This will be noted in your shopping cart. *Please be aware that factory direct items are not returnable. We also offer a wide variety of everyday 674. View More In Wrapping Sets. If you have any questions about this product by Paper Mart, contact us by completing and submitting the form below. If you are looking for a specif part number, please include it with your message.